When you walk into Aria Stone Gallery looking for the perfect stone for your new kitchen countertops, you might think that you've wandered into an art gallery instead. Each carefully chosen slab is hung on the wall like the piece of art that it is. We recently spoke with the team at Aria to learn a little more about the gallery and their design process. For those who don’t know, tell us the story behind how your owner and founder, Vinny Tavares, started Aria Stone Gallery. What better way to hear Aria’s backstory than straight from Vinny himself! “It all started when I visited the National Museum in Stockholm and had the opportunity to explore their installation of Slow Art and understand its philosophy and fundamentals. Slow Art is about being more aware of the origin and history of the materials used in artwork. It forces people to concentrate on a single piece rather than zoom by. I was intrigued by the concept and started to wonder how I could apply those concepts to the stone industry and design world. That’s where Aria comes in. It’s about truly appreciating the pieces of art that nature has created so slowly over centuries." 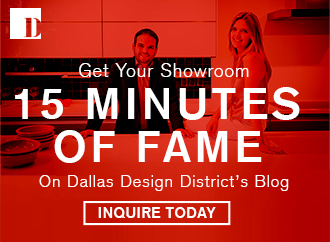 What brought you to the Dallas Design District? Aria was born with the intention to service both the design trade as well as the general public by offering a transparent pricing model. 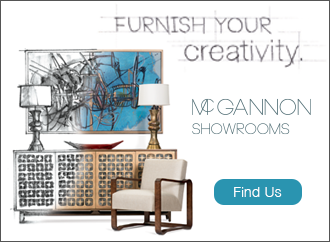 We wanted to provide a different experience by showcasing stone in a comfortable, luxurious art gallery-style setting. 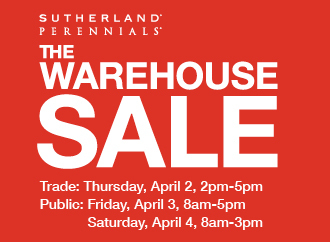 We also wanted to make the location more convenient for our customers while they shop in the Design District, allowing them to easily travel back and forth from other design showrooms. What is the Aria Stone Gallery difference? The constant pursuit of the perfect slab is what sets Aria’s collection apart as a unique stone boutique. Instead of trying to fulfill a predetermined stock list of standard materials, our selections are made based on the uniqueness of each stone. Our materials are evaluated for their color, content, clarity and consistency, with consideration paid to how the vein structures lend to bookmatch veining. Customer service is at the heart of our company — we even offer a LiveChat service on our website to assist our clients in an efficient and convenient manner. Your team is in “pursuit of the perfect stone,” as you put it. What does this mean and how would you define “the perfect stone”? Aria’s owner, Vinny Tavares, frequently travels to the most exclusive quarries, from Brazil to Italy to the Middle East, to source the “perfect materials" — in other words, first-quality-only slabs. We pride ourselves on being one of the only suppliers to do this. The quality and uniqueness of our slabs are graded based upon five factors: richness of color, structure, size, vein composition and natural quality. During the design process, which elements are important to consider when choosing stone? 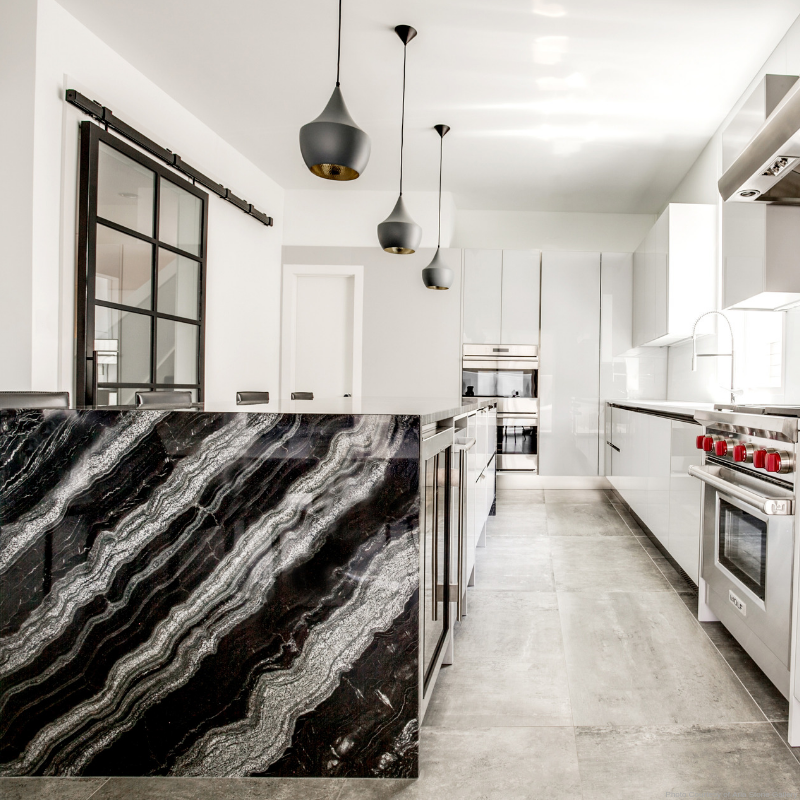 Aside from elements such as veining structure and color, slab thickness should also be on top of your list of factors to consider while choosing stone. Some clients prefer thicker slabs for sleek, luxurious countertop overhangs, while a thinner slab normally works best for feature walls and fireplace cladding. The stone’s chemical makeup is also important to consider depending on your application. Each and every natural stone reacts differently to everyday activities and is composed of different minerals. For example, if you plan to use a marble (or a softer stone) in your kitchen, you might consider sealing and protecting it if you cook frequently or have messy kids. You were recently involved in a very exciting kitchen renovation with Whitney Port! 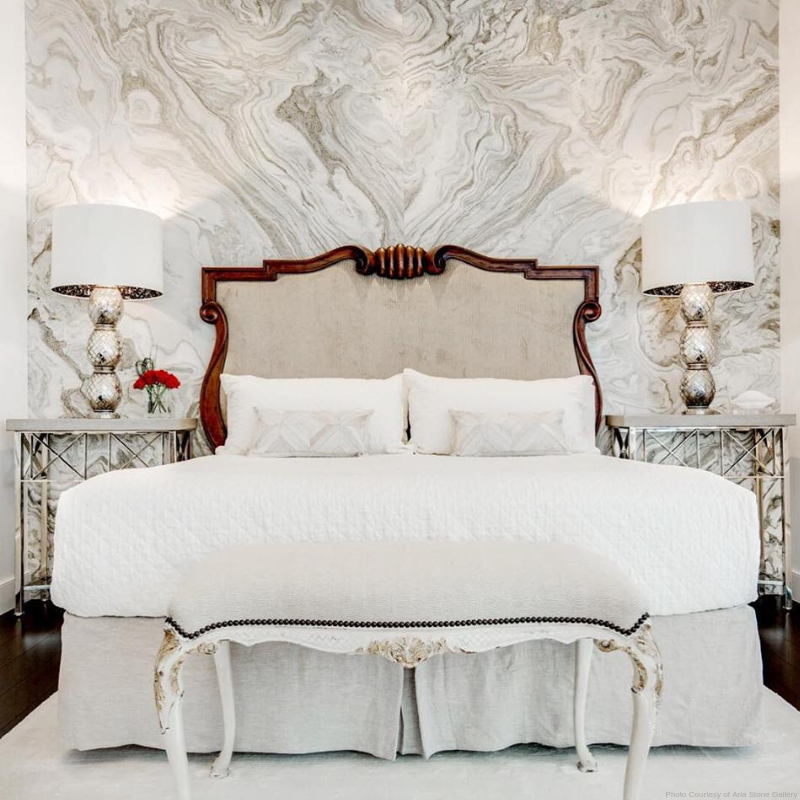 Tell us a little about that design process with Marie Flanigan Interiors and about the stone Whitney used. 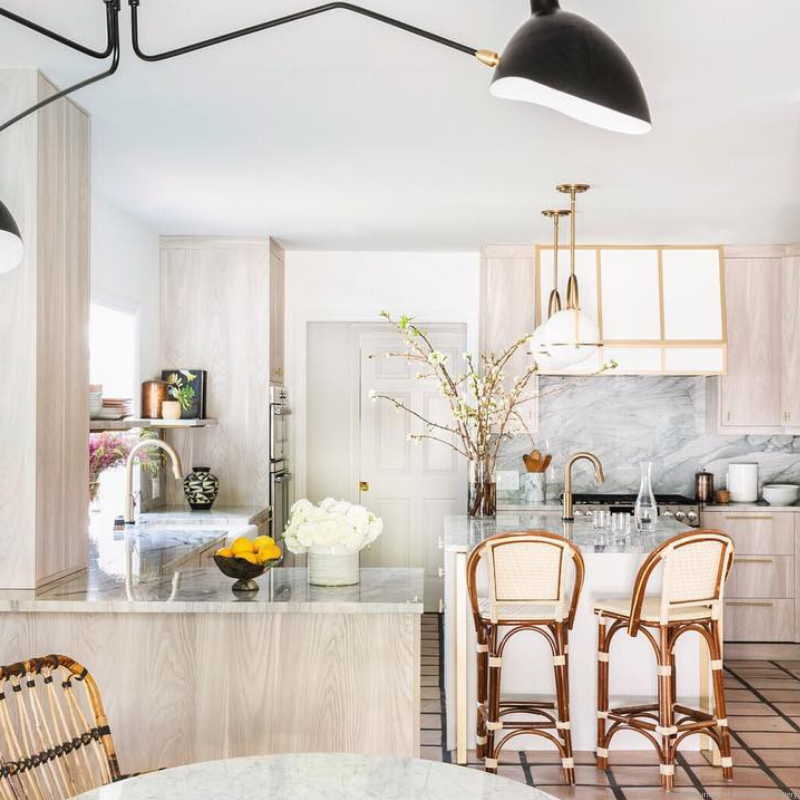 Our collaboration with Whitney Port and Marie Flanigan Interiors on Whitney’s LA kitchen was such a thrill, especially when we saw that the project was featured in Architectural Digest! It truly was a wonderful experience working with Whitney and Marie. Whitney selected beautiful Arizona Quartzite for her kitchen on Aria’s e-commerce website, and we worked closely with her in making the selection. She wanted a durable stone that was unique with a clean look that also made a bold statement. The Arizona Quartzite that she selected picked up the peach and blue hues that she incorporated throughout her entire house, tying the entire color palette together seamlessly. She also used the material as her backsplash and open shelves. Get a similar look with Arizona Quartzite’s doppelgänger: Florida quartzite! You mentioned that Whitney purchased her stone from your website. Can you tell us a little more about Aria Stone Gallery’s e-commerce offerings? Aria Stone Gallery launched our first online storefront for natural stone in 2017, allowing our customers to browse Aria’s entire inventory from the comfort of their own homes and purchase stone directly with ease. It's the next step in strengthening our transparent, educational approach to natural stone, giving the customer a better understanding of the origin, rarity, quality and price of the natural stone that they select. Any favorite pieces or types of stone at the moment? Aria Stone Gallery just released our massive Summer/Fall 2018 collection, featuring over 70 new materials sourced from quarries all over the world. One of our favorites so far has been Bianco Versailo marble — we hadn't seen such a pristine and unique bundle of Bianco Versalio in our gallery since about 2016, so it was a truly exciting moment for all of us. What trends do you see for stone in the next year? 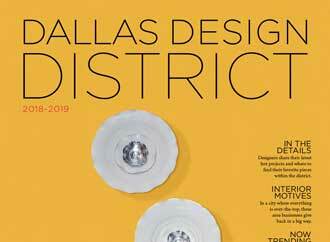 We recently collaborated with D Magazine on an article titled “5 Natural Stone Trends to Try in 2019" to share our insights on trending designs. 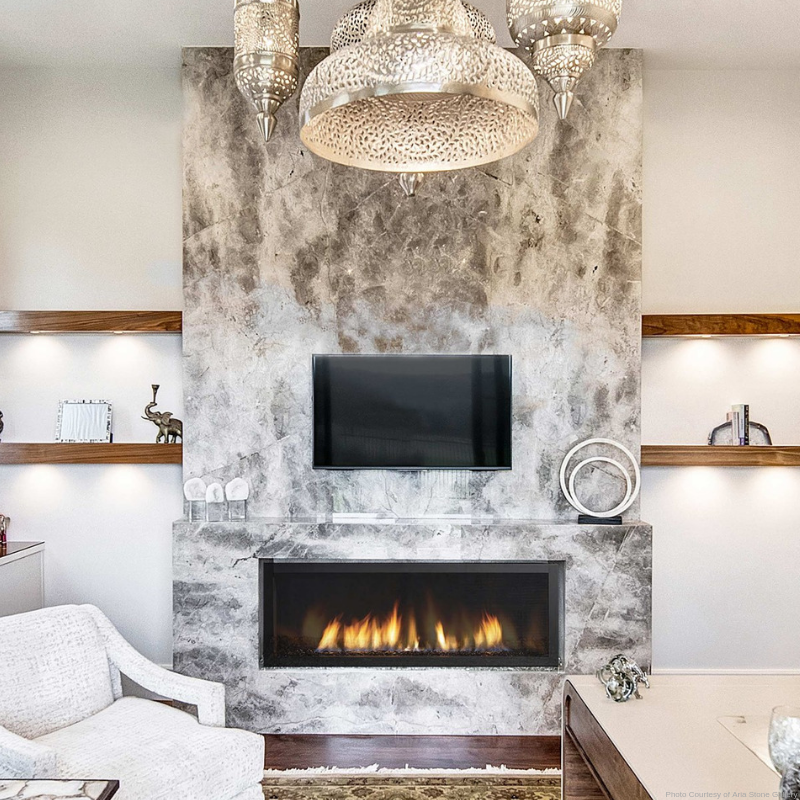 We especially love seeing large spaces completely clad in stone, as well as hand-crafted, natural stone furniture with unique, artistically sculpted edge details. These trends are really starting to take off everywhere we look. Next time you’re in the market for a beautiful slab for your next home project, Aria Stone Gallery is not to be missed. Stop by to talk to the team and take in the beauty of all their offerings.